The night for all people. Join us on October, 18 to celebrate the Nacht der Vielfalt – Volkshilfe Integration Ball. There still are 3 more months to go, but we already have some exciting news for you. 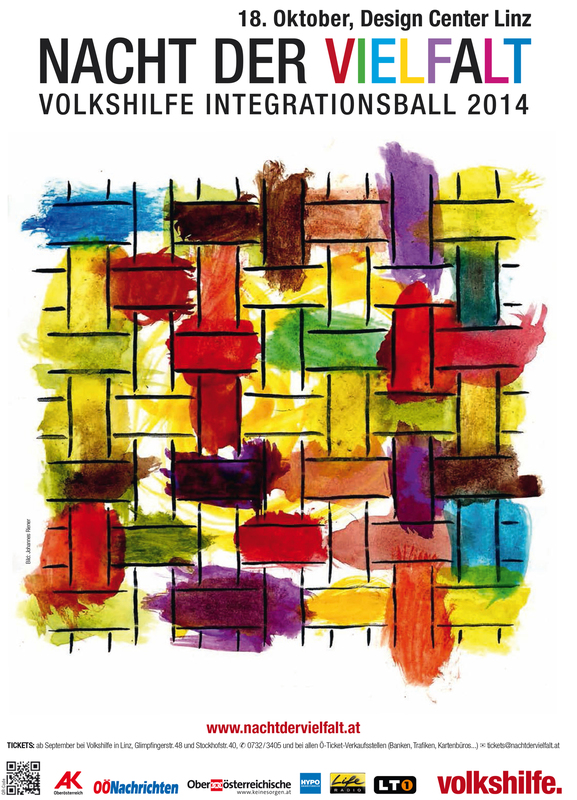 In the last years, our poster was designed by Gerhard Haderer, Ulf Kossak or other famous Austrian artists. But this year we wanted something “fresh” and therefore invited art students from the University for Arts and Design in Linz to send us their poster-designs. One outstanding design struck the jury right away. The brothers Johannes and Bernhard Riener designed a colour- and meaningful poster. The basic design and concept was done by artist and arts student Johannes. 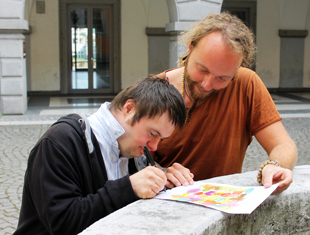 His brother Bernhard – who has Down’s Syndrome and really loves to paint – helped to bring some life and colour into the design.